I think I've found one of my favourite colour combinations - Gorgeous Grape and Granny Apple Green! Who would have thought! Today's card features the Lovely Lattice stamp set. This set is available as a Sale-a-Bration reward - free when you spend $60 CDN. It's perfect for watercoloring. 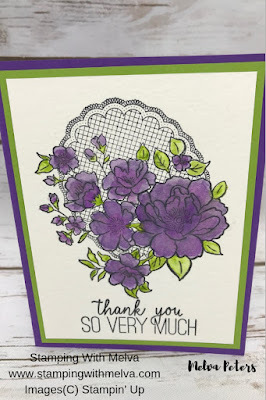 I stamped in Tuxedo Black Memento Ink and then water coloured using an Aqua Painter with Gorgeous Grape and Granny Apple Green. It's hard to see in the card, but once the ink dried, I added some shimmer using Wink of Stella. Fold card base (5 1/2" x 8 1/2") in half to form card base. Once dry, colour flowers using Aqua Painter and Gorgeous Grape ink. Start with small amounts of water and dip onto ink pad. As an alternative, you can drop a few drops of reinker into the lid of the ink pad and pick up with the Aqua Painter. Colour the leaves with Granny Apple Green. Adhere water colour paper to Granny Apple Green cardstock (4" x 5 1/4"). Please be sure to use the current Host Code 4DQC2P33 to receive a free gift from me in March. When you place a $50 order (before shipping and taxes) using the Host Code, I'll send you four cards and instructions by mail as a thank you. If your order is over $200, please do not use the Hostess Code as you'll qualify for Stampin' Rewards, but I'll still send you the 4 free cards! Have you heard that I'm hosting a Crafting Day? Come join me on April 6th - 3 options for the day - craft on your own, morning class or morning and afternoon class. Check out the details for this event here. I have spots available for all options!